Often, ultimate is thought of as an-offensive dictated sport. That has not rung true more than this past weekend of action for the DC Breeze. Losing to the Toronto Rush 28-21 and then securing the ‘Battle of the Capitals’ title over the Ottawa Outlaws 30-29, DC gained a valuable weekend split. The Rush never failed to score on offense. Ottawa struggled to score on offense in the most important portion of a game. 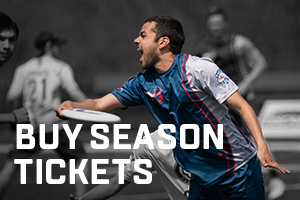 With an AUDL-size field, offense has never had more of a command of the disc. O-lines know where they are cutting, defenses cannot cut off sections of the field, and bringing officials to the sport essentially prevents most forms of contact. No matter how good a D-line is, if the offense makes no mistakes, they will not lose. While the final line came down to a seven-point spread, Toronto’s offense did not falter. DC’s D-line failed to get a single break. Part of that failure was because many of the defensive regulars had to step up to the O-line. Christian Boxley (24 O Points), Delrico Johnson (24), Ryan Swift (24), and Marcus Thaw (23) all made that jump. Of course that limited the defensive options. With the switch, Johnson (+6) had a season-high seven goals, of course all being offensive holds. Jeff Wodatch was held to a single goal while many other rookies racked up some of their first tallies on the season. Moving on to Ottawa, Lloyd Blake (+0) was back in the fray, and this opened up the door on the D-line. While the Breeze trailed for a majority of the contest, they rallied for three breaks in the final minutes of a 12-point third quarter. The battle intensified in the final quarter as the Breeze held on by a single point. Boxley matched Johnson’s seven goals from the day prior with seven of his own as he suited up for his second game with the O-line. It was the best game of the season for Matt Kerrigan (+9). Touching the disc 25 times, Kerrigan did not turn over the disc once for the O-line. Eight of the 25 times he found someone in the end zone, 16 times he kept the offense flowing, and once he caught the disc for a goal of his own. In two games this week the Breeze only recorded 23 blocks, 11 against Toronto and 12 at Ottawa. Joe Richards combined for five blocks to lead the team, but 12 others were able to get on the stat sheet. Without Johnson holding the fort on the D-line (he still managed to get a block) the rest of the unit spread the wealth. As for perfect weeks, that was difficult in a doubleheader. No one managed to complete ten passes without a turnover in both games combined. Kerrigan came the closest going 50-for-51. And Nate Prior was inactive this week, so he still has completed 134 passes in a row.